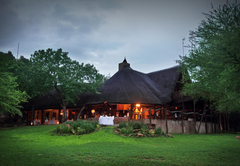 Itaga Private Game Lodge is a Limpopo game lodge providing a wildlife experience for tourists visiting Waterberg. 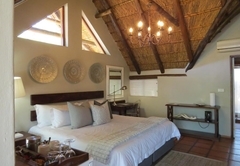 Nestling in the shadows of the Waterberg Mountains, near Bela-Bela, Itaga Private Game Lodge is located in the greater Mabalingwe Nature Reserve - a Malaria free area of Limpopo Province and home to the 'Big 5'. It takes only two hours to reach Itaga from Johannesburg and just over an hour from Pretoria, travelling via the national Polokwane road. 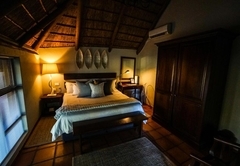 Itaga Private Game Lodge is an exclusive but affordable luxury lodging establishment offering eight unique and tastefully appointed with climate controlled air-conditioning for maximum comfort in warm summers or cool winters, African themed chalets. 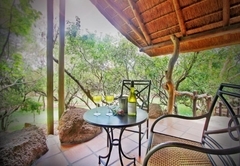 The rooms have private pergola covered patios with comfortable waterproof outdoor furniture, perfect for lazy afternoons. 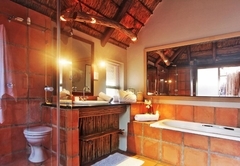 Guests have a heated en-suite with a choice of either shower and bath, or shower only. 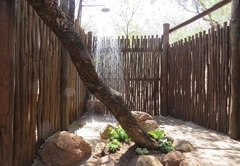 Most rooms also feature a screened outdoor 'bush shower' for that exhilarating 'Out of Africa' experience! 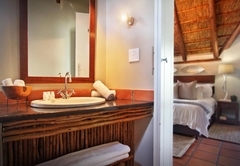 All rooms are equipped with electric hairdryers and power sockets. All rooms are non-smoking. 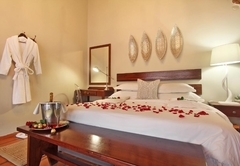 The superior rooms also include tea and coffee making facilities, guaranteed inside and outside shower, digital safe, special bathroom amenities, bath robes, slippers and late check out (13h00 instead of 11h00). 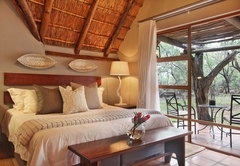 The thatched central complex has a romantically appointed dining area; an intimate lounge with feature fireplace; a cocktail bar with viewing deck overlooking the floodlit waterhole; a cozy open-air bush boma; an all day tea and coffee refreshment station for the convenience of our guests; a DStv loft lounge and library; a gift, curio and fashion goods boutique and a swimming pool with large sundeck. 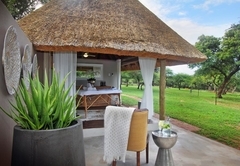 The elevated 'upper deck' offers stunning views across the plains and the quiet solitude of this private location makes it the perfect place to witness sensational sunsets, whilst savouring the moment with a sundowner cocktail. 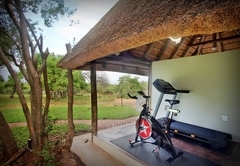 For the safety of our guests (and the protection of our Marula trees from mischievous elephant), the area surrounding the camp is encircled by an electrified game fence. 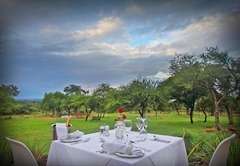 Itaga has traversing rights over more than 12,000 hectares of good game country - home to Elephant, Lion (separate enclosure), Leopard, Rhino, Hippo, Buffalo, Giraffe, Zebra, Wildebeest, Hyena, Warthog, a wide variety of antelope / plains game and bountiful bird life. 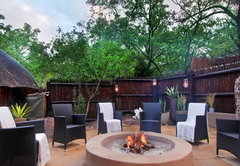 Guests can enjoy an early morning or afternoon game drive with an experienced tracker / ranger in our open 4 x 4 game vehicles, with individually contoured bucket seats for the comfort of each passenger. Like many other Private Game Reserves, the lions in our reserve are contained in a separate high security, fenced area of the reserve. 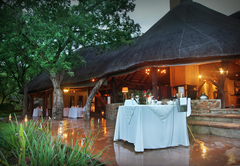 It is necessary to book for a visit to the Mabalingwe Lion enclosure - cost on request including transport to / from the Lion camp and Itaga Lodge. 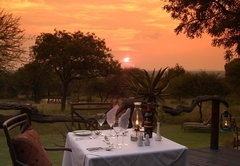 Visits to the lion enclosure at Mabalingwe should be pre-booked after arrival and will be subject to space availability, based on the limited number of permitted visitors for each scheduled game drive / viewing experience. 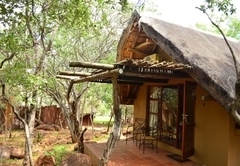 Visitors are not always guaranteed to see the lions as they can be elusive! 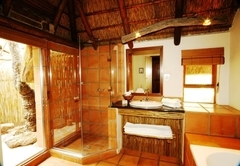 Standard chalet with inside / outside shower or both. 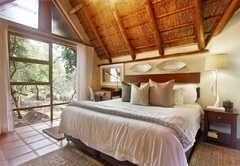 Beds can be arranged as double or twin beds based on your preference. 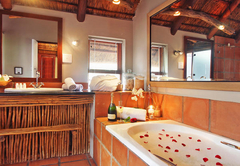 Standard chalet with a bath, inside / outside shower or both. 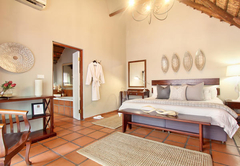 Beds can be arranged as double or twin beds based on your preference. My wife and I wanted to spend some time relaxing. This was the place to be. We did a three-day trip and spent the entire time at Itaga. There were a few wonderful things that really stood out. Firstly the friendly staff. From the reception to the chefs. 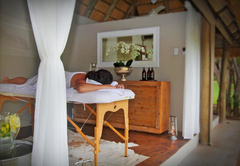 All the members of staff made you feel welcome and comfortable. Secondly, the food was superb. 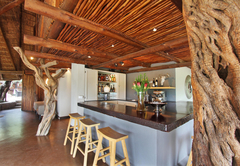 If this place was closer to Johannesburg, I certainly would frequent the restaurant more often and take clients there. The food was delicious and well presented. Thirdly, the knowledgeable ranger. We often go to the bush, but the knowledge we gained this time was different and very interesting. 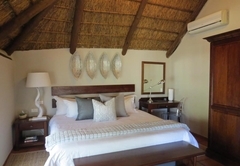 The rooms were above average, very comfortable but not the standard I was expecting. It does not mean that I will not return. They were very acceptable and will not prevent me from coming back at all. There is no doubt that I will be returning for another visit. 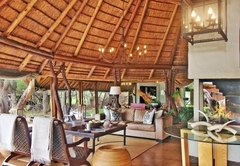 Response timeItaga Private Game Lodge typically responds to requests in 5-10 minutes.